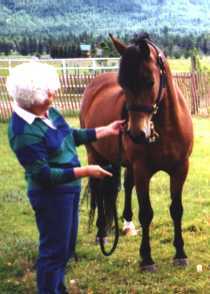 Don with MiSue Love's Legacy ("Leggy") Back in 1977, Donald and Eileen Barnes purchased Noble Susan. Although they had owned Morgans before this time, "Susie" became the foundation for their breeding program as it exists today. 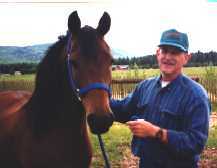 They carefully choose bloodlines to produce typy, usable, and friendly Morgan horses. The horses now roam at Mi Cyn Morgans. They have a great view of Columbia Mtn. This environment is perfect to raise horses that are not only National Champion quality, but also gentle enough to teach the grandchildren to ride.